The exclamation point on a photo!!! Have you ever opened Lightroom to work on a photo and experienced the dreaded EXCLAMATION POINT at the top right of the photo, in that little innocuous square box? You click on Develop and you can develop your photo but that little exclamation point still does not go away. Maybe you want to export that developed photo and you click on export, only to find that you cannot export it? A pop-up box appears that says you are “unable to export. Source file(s) are offline or missing (see Graphic 1).” If this happens to you, don’t panic (at least not right away), as it does not mean that you have lost your photo, although, depending on what action you took to the photo outside of Lightroom, that could be the case. It’s most likely that you have “misplaced” your photo by moving it around outside of the LR application which breaks the link between the application and the photo. If you move photos outside of the LR application window, accessing the files and folders directly on your hard drive, the photos that have been linked to LR will show up as missing: that is what the exclamation point means (see Graphic 2) earlier versions of LR used a question mark). What you will see in LR is the preview copy of the photo. Since you can work on a preview copy in the Develop module you can still make changes or edits to the preview copy, but that is all you can do as the original file is no longer linked to the LR application. You cannot print or export it or use it in any other way. So, how to fix this? First, you need to find the original photo that was originally linked to the LR application if you do not know where you have put it. When you click on the exclamation mark a box will pop up and ask if you want to locate the photo and it will tell you where it was last located, when you linked it to LR (see Graphic 3). However, it does not tell you where it currently resides. -If you know where the photo is on your hard drive you can follow the pop up box instructions and locate the photo, then re-link it to the LR application and it will once again show up in LR with all its edits. If you don’t know what you have done with it then you will need to back track to remember what actions you took outside of LR and to where you moved the file. If you can locate it in its new location, you can re-link it. If you’ve somehow thrown it away and cannot retrieve it from the trash (I’ve retrieved many files from the trash: on my Mac I just need to move them back onto a hard drive) then you can panic because it will be gone, UNLESS you have made that all important back-up of your original file. 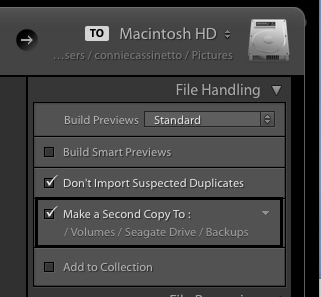 You should be backing up photos as you import them into LR (see Graphic 4). The backup should be on a hard drive or external drive that is separate from the drive where your original files are stored. It’s vital to back up your LR catalog frequently, too, especially after an edit session. 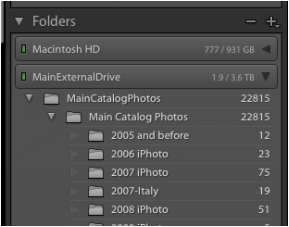 I just had an experience where I moved 22,800 photos from one drive to another, working within LR, creating a new folder as described below in order to have a new external drive show up in LR. Everything checked out great, no problems, everything linked up. Then I started copying files from one hard drive to another with LR closed. Upon checking LR when I next opened it, I found about one-half of my files now had the little exclamation point: the copying of files from one drive to another had impacted the LR links. I had to re-link all of the files that were no longer linked, which was not too difficult since all of the photos were still in the same place and the pop-up box for re-linking would tell me exactly where they had resided on my computer and LR links all files associated with that folder in one action if you check the "Find nearby missing photos" box (see Graphic 5). It’s sometimes possible to simply re-link the entire file of photos, but that did not work in this instance. I also got the dreaded “corrupt catalog” pop-up box when I tried to close LR, but LR fixed itself. If it had not fixed itself, I had run a back-up of the catalog before I started moving everything so I would have been able to use that copy and all would have been fine. What if the hard drive you want to use does not show up in LR? What if you want to use an external drive to move your photos to and that drive does not show up in LR because you have no photos on it? In the Folders panel in LR simply click on the + icon at the top right and choose New Folder (Graphic 6). When that box opens, navigate to the external drive you now want to show up in the LR application and choose new folder. Name the folder. It will show in that hard drive. Click on Choose. Now that folder will show up in the LR application and you can move files to that external hard drive within LR. You can re-arrange photos in any way you need to within LR. Anything you do with the folders in LR is reflected back on your hard drive where the folders are actually stored. Remember—LR does not store your folders and photos, it just links to them on your hard drive (internal or external) where they reside. The LR application is not a data base, it is an application that allows you to take multiple actions to work on photos and it includes a catalog data base that stores all of your edits, not the photos themselves.